Put the world’s lightest and fastest slope meter on YOUR ski pole. Knowing slope angle is a critical factor in assessing avalanche hazard. 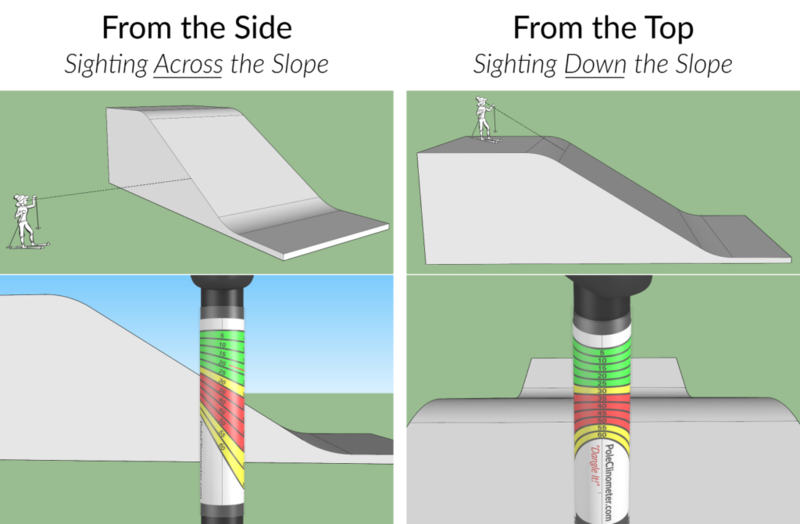 The PoleClinometer® slope meter is the quickest/easiest way to get accurate “on the go” slope angle measurements. It’s a sticker you put on your ski pole that lets you measure slope angle by line-of-sight. In both cases, just DANGLE IT! Your pole must HANG FREELY from a loose grip for an accurate vertical reference. Check out the use instructions for details and other use modes. The PoleClinometer slope meter will fit most ski poles available today. There are some exceptions, so you might check the fit page just to be certain, but odds are it’ll work with what you have. Go ahead, beat the crap out of your gear. PoleClinometer can take it. Its burly crystal clear “heat-shrink” over-wrap sleeve protects the sticker and makes it uber-tough. Both the over-wrap and the sticker itself are waterproof and UV-resistant. 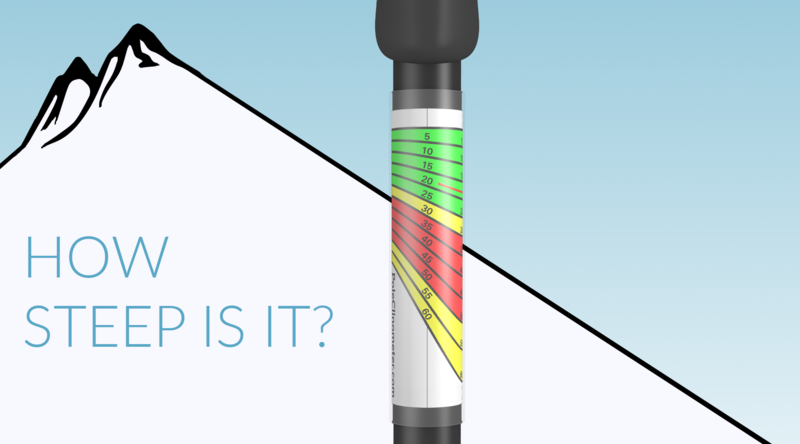 Don’t be surprised if your PoleClinometer slope meter out-lasts your ski poles! The goal of PoleClinometer is to help people stay safe in the mountains. By making it quicker & easier than ever to read slope angles accurately, we hope the product will improve folks’ awareness of terrain as they travel through it, and ultimately lead to more informed decisions and improved avalanche safety. But of course inclination is just one piece of the puzzle, and education is where it all comes together. Your brain is the best tool you have for staying safe in the mountains, so take the time to sharpen that tool with top-notch training. Know your slope angles. Ski safe. Have fun!